Reality TV teaches us that nowadays everyone has a sob story. There's been some hardship, a traumatic event or terrible tragedy that has led them to this point of their life. I am not one of those people. I am very fortunate to say that my life so far has been everything I could hope for. I have great friends, fantastic family and many happy memories to remind me of all the people and things I love. My grandma features in plenty of the best memories. When my sister and I were little, we differentiated between our grandmas by their cats; Nankee and Tom (I distinctly remember arguing with my reception class teacher who would not write 'Tom' on the picture I'd drawn of my grandma as she insisted I'd got the wrong name). Grandma Nankee, or Eunice as everyone else knew her, was everything a grandma should be. Caring and loving, with a well stocked chocolate cupboard just for us, we spent much of our time with her growing up and loved every second. In the last few years, age caught up with her and she found it harder to recognise us when we visited, until she didn't know any of us at all. So when she slipped away earlier this year, at the grand age of 94, although sad, we knew that it was a release for her from the daily confusion she had come to live with. Grandma Nankee is never far from my mind and I think about her often. So when I read about One Sheepish Girl's Sheepish Bloom Drop, it was obvious where my yarn bombing should take place; my grandmas' memorial bench. 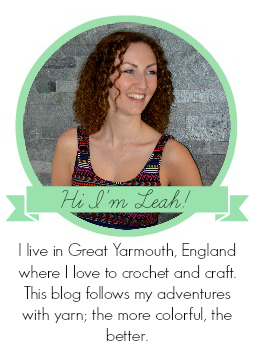 This idea made me very happy; although I think that anything covered in crochet is immediately 10x cooler than it is without, I appreciate that others find it less appealing or litterish. Yarnbombing the bench felt like a fitting tribute to a grandma who was so well loved, but also allowed me to feel comfortable leaving my little yarn packages for others to see. So early on Sunday morning, Squitchy and I set off for Gorleston cliffs to my grandma's bench. The bench sits just in front of my mum's childhood house where she has lots of happy memories. It's alongside the clifftop putting green and looks directly out over the beautiful sandy beach. 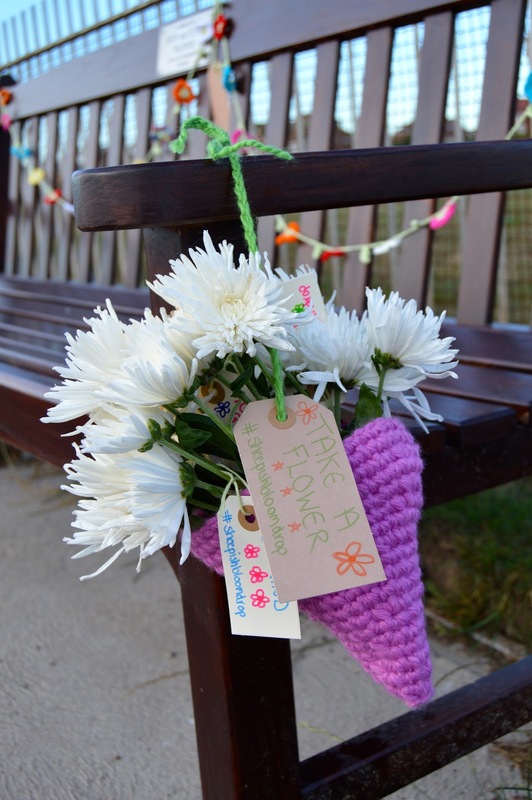 I made a colourful daisy chain which I hung across the back of the bench and two crochet hanging baskets filled with pretty chrysanthemums and carnations. 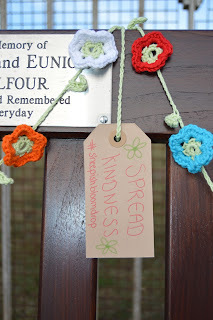 Attached to the flowers were labels with happy sentiments on. Now, anyone who knows me knows that I am not a motivational speech kind of girl. In fact, it couldn't be more opposite to me. However, on this occasion, it felt right. 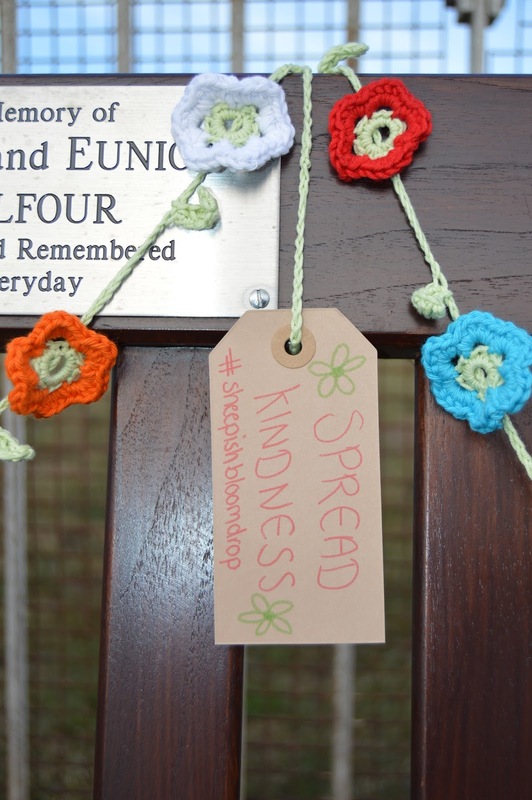 Nothing too mushy, simple statements like "Smile" "Be kind" and "You are lovely" with larger labels inviting people to take a flower. I went early in the morning so that the bench was decorated before many people were around. There were still a few people about setting up for an athletics event who took great interest in what I was doing, but I kept my head down and continued with my work. I was pleased with how it looked; before I went I worried that the chain wouldn't be long enough, or the flower pots wouldn't work but actually things were just fine. It wasn't too much, but enough to catch people's eye. Just after I took my final satisfied look at the bench and returned home, the sun came out from behind the clouds and I'm sure it's made my pretty flowers look even more appealing. I just hope that people stop and look and help themselves to the flowers; I'll be disappointed if I go back and it's untouched. My hope is that my little splash of goodness will make someone happy enough to want to pay the kindness forward. Who knows. But at the very least, I know my grandma would have stopped and looked and smiled if she had seen the bench, and that's good enough.